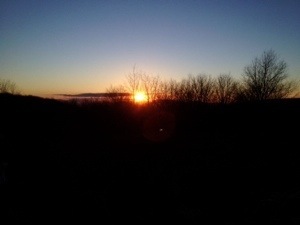 A super nova sunset capped the day at Chestnut Knob Shelter. We were surrounded by four walls with a door. Glory be! The temp was moderate through the night. My lactic acid soaked muscles would not let me sleep. Even though I throughly stretched. Nature called around 2 am. When I opened the door, a starry, starry night hung overhead in all its mystery. The wind was calm and the temp comfortable. Before zipping up my down cocoon I took a sleeping pill and slept fitfully until 7:30 am. Matt, the hiker I met at Knott Maul was in no hurry either. He is a very pleasant engineering technology student hiking from Georgia to Harpers Ferry. We decided to team up until Pearisburg where he plans to visit a cousin at Virginia Tech. Seems I’m one of the few folks he’s seen since around Thanksgiving. We launched around nine o’clock. That late hour is unheard of on Team Sisu. The sky was severe clear – pilot speak for cloudless. The temp ultimately reached 60F. Do you believe it! Take that polar vortex. We hiked reasonable PUDs ( pointless ups and down in AT speak) most of the day along a basalt escarpment formed by a thrust fault. My old friend leaf litter was back with a vengeance. Dry and slick as banana peaks, the litter transformed the rocky path into a Winter Olympic sliding event at times. We reached our destination just past three. The Jenkins Shelter was papered in fresh bear warning posters. Not the usual kind, ones with a strong suggestion that using the shelter might be a bad idea. Too bad. The real estate was above average as shelters go. 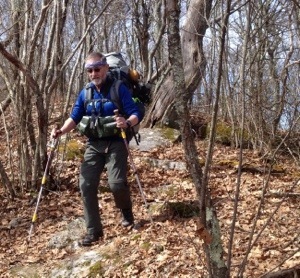 The next camp site was five more miles away beginning with a steep climb. I’m thinking what a choice. Get mauled by a bear or maul my body myself. No brainer after my bear encounter at Carter Gap. I was actually feeling strong physically. So off we went. 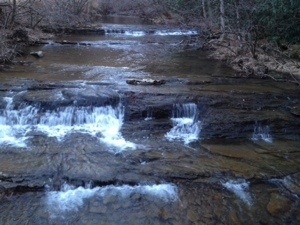 Thanks to a gentle elevation profile on a disused logging road, we covered the five extra miles in less than two hours. 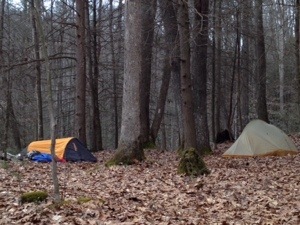 We’re currently tenting at Laurel Creek. The water is gorgeous. That’s the first time I’ve pitched my tent since just after Thanksgiving. It may not even dip below freezing tonight. You bet that a day can make a lot of difference. Now to see what tomorrow brings. Sounds like you’re back to making good progress. Jim and I went for a short hike locally, a slippery slushy snowy trail near the dam and reservoir. Some areas were pretty deep while others were beaten down and slick. PUDs, yes, some of that. But following the edge of the res, that’s what you’ll get. I would have chosen a little more hi_e than the possibility of a bear problem. The _ stands for the letter between J and L. _eyboard is going out on me. Sounds like a great trail day!